The first cookies I ever made by myself, at around 12 years of age, were snickerdoodles. Around that time my Mom went back to work, leaving my brothers and I in charge of cooking dinner for the family. She would leave step by step instructions for simple meals, and a hot dinner would be ready for her and my Dad when they got home. This is how I learned basic kitchen skills and where my love of cooking began (a love of eating had already been established). I soon began making desserts from my Mom's Betty Crocker cookbook (enter the snickerdoodles), and from a box filled with my great grandmother's recipes for Boston Cream Pie and other delightful sugar and fad-laden treats. So when I saw this snickerdoodle recipe on Have Cake, Will Travel, I immediately tagged it. I finally got around to making them today for a nice after lunch treat. 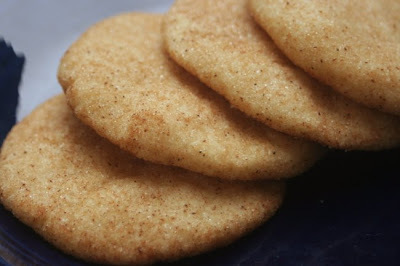 They are crisp yet soft, and are everything a snickerdoodle should be. I did add a tsp of canola oil to a double recipe because the dough seemed too dry, and I made bite-sized cookies that fit perfectly into the kids' lunch bags for school. Thanks, Celine!